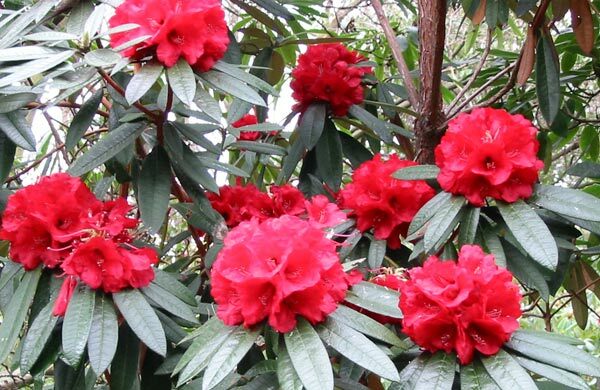 The rhododendron-trees are typical of old established shrub plantings around Canterbury - the early bloomers have beautiful blood-red flowers and huge twisting trunks. I'm sure they are some extremely old variety, maybe even a species. 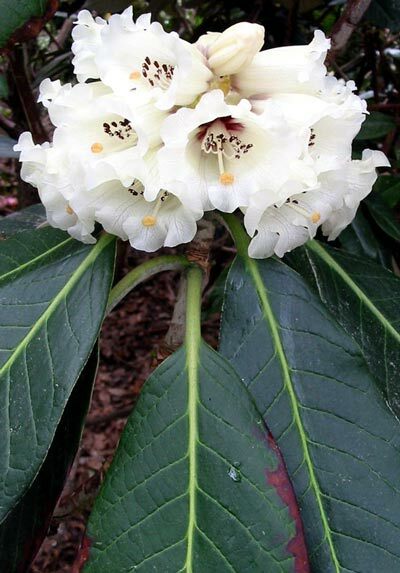 At the time of this first Moosey visit only the red rhododendrons were flowering, while all the deciduous Azaleas (the so-called Ilam hybrids) were still in bud. These azaleas are world famous. 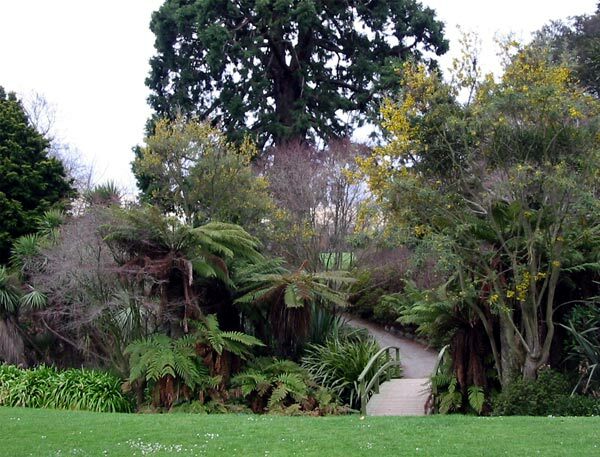 Many of the trees in the Ilam Botanic Gardens are old, huge, and introduced from over the water - like the giant Californian Redwood trees from the United States of America. 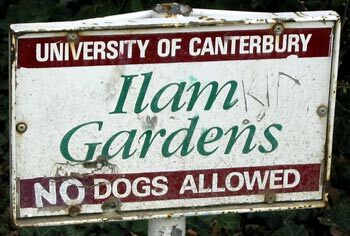 This is again typical of early park-like plantings in Canterbury's public gardens. So how do you know you're in New Zealand? You have to look for the spiky Cordylines (Cabbage trees), the ferns and the flaxes (Phormiums). In the Ilam Gardens there is a magical network of paths, and sturdy bridges criss-cross the natural spring-fed stream. There are regulation daffodil and bluebell fields (of course - this is a spring visit), and neatly mown lawns where fat, tame Mallard ducks waddle about their duck-business. It's all part of the grand colonial ambience - the massive rhododendrons, the wide paths, the swathes of manicured lawns, the picturesque stream - all taken from a park in Mother England and transported here with the early settlers. Masses of ferns fill in the gaps between the Gunnera water-side - it's a little early for their giant leaves to be unfurling. And fat Camellia bushes are in full flower, however, with the usual mixed colour scheme of red, pink and white. Being a very highly impressionable and inexperienced Botanic Gardens visitor, the Garden Reporter Moosey leaves in a haze of hopeful inspiration. Now she's planning to triple the width of her water race, tame her terrified ducks and replace all her small compact rhododendrons. Did I say hopeful?... or perhaps hopeless!! !